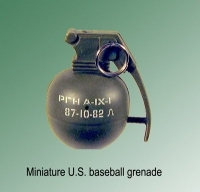 Grenade as loose item (inert ) [AMMO-008] - $20.00 : Metalcraft by Blair - military gifts and memoribilia. Haveing a bad day (no problem) take a number: outside please This unit is mounted on a simulated marble base and has a place for an engraved name plate , add a pen and it becomes a unique desk set, guaranteed to cause conversation. This ammo is sold by the foot, their are 23 rds per foot. Ammo is inert (non Explosive) you must be 21 or older to buy this product. SOLD ONLY IN THE UNITED STATES. NO FOREIGN SALES.